Kylie Jenner just confused the heck out of everyone with a couple deleted tweets. The 18-year-old reality star supposedly got into a war of words on Twitter about the #BlackLivesMatter movement -- but she says the whole thing was fake. 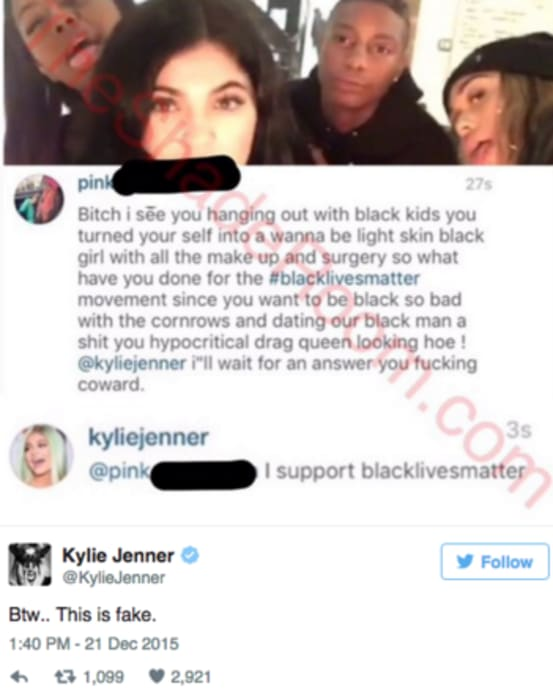 In a now deleted tweet, Kylie was supposedly being called out by a fan in an Instagram post for not supporting the Black Lives Matter movement. It all began when Kylie posted a screengrab from TheShadeRoom that shows a supposed Instagram follower laying into her, "You turned yourself into a light skin wanna be black girl. What have you done for the #blacklivesmatter movement." Based on the screengrab, it looks like Kylie responded to the comment, but she says that isn't the truth. As you can see, Kylie took a screenshot from the Instagram post, captioning the photo "Btw...this is fake." A few moments later, the reality star took to Twitter to follow up with her previous comment, attempting to clear the air. "Not saying that's what I don't support.. It's just fake," she said. It's hard to say what is going on here. Could Kylie's Instagram comment be a fake account? Or was there just miscommunication? The world may never know. In the meantime, check out some photos of Kylie Jenner in the gallery below. Throwback. Love this outfit I created.